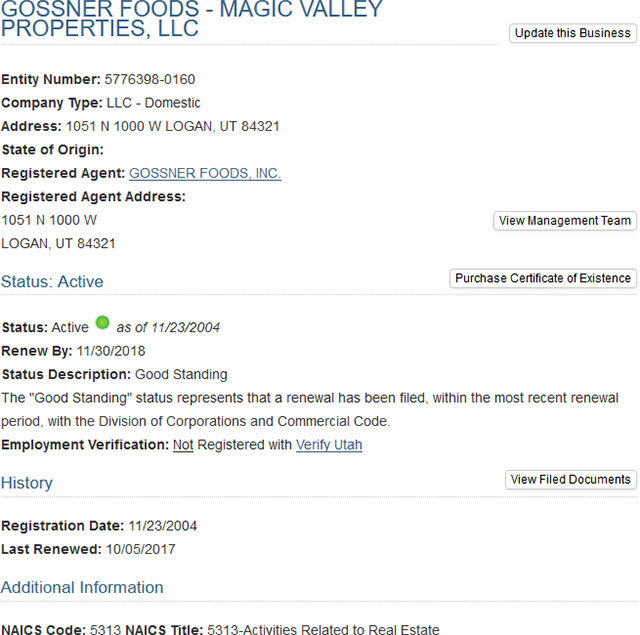 The online business search tool facilitated by the Lieutenant Governor of Utah provides you with the choice of finding any business entity or corporate that is registered within the state.To perform the search, you need to know the business name or entity number or the executive name of the entity you want to find. Below is a step by step guidelines on how to use the Utah business search tool. 1. The first step is to access the Utah business search page by clicking here. The search page looks like the screenshot below. 2. This business search form allows you to search by name, number or executive name. For this example we will be searching by name. 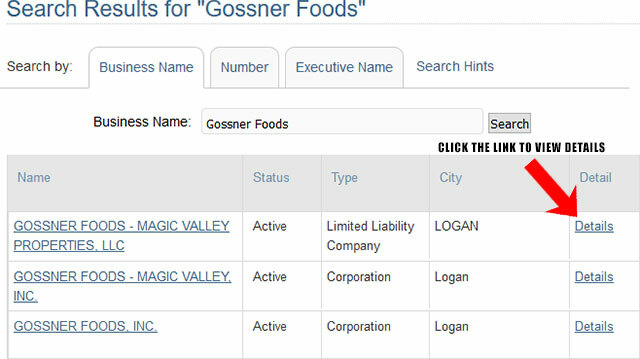 Go ahead and type "Gossner Foods" in the "Business Name" field. Once done, click the "Search" button as shown in the screenshot below. 3. Once you click the "Search" button, it will show you a list of results that match your search criteria. They display the name, status, type and city for each business entity found. To view the details for a business, click the "Details" link. 4. When you click the "Details" link for one the business entities in the list, it will take you to the details for that business. This includes the entity number, company type, address, current status, renewal dates, history etc. You can reference the screenshot shown below. There is no Secretary of State in the US state of Utah. Instead there is the Office of Lieutenant Governor in Utah. All the duties that are served by the Secretary of State in the other states are served by the Lieutenant Governor in Utah. The Lieutenant Governor of State was only created in 1975. Prior to the creation, the Governor was succeeded by the Secretary of State of Utah. Spencer Cox is the current Lieutenant Governor of Utah or the Secretary of State of Utah. 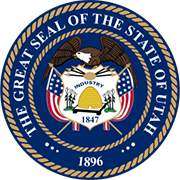 The duties of the Secretary of State of Utah include overseeing the public affairs of the state and guarding the Great Seal of the State. The Lieutenant Governor of the state or the Secretary of the State has the authority to attest government documents using the great seal of the state. The statutory duties of the lieutenant governor include overseeing of the Notary public, authentication of documents and keeping a record and regulating the registered lobbyists.